A microphone windsock is the foam piece that is placed over a microphone which serves to block out certain intrusive, unwanted noises from reaching the microphone and getting recorded. Noise is all around us and a microphone, unless having the aid of a windsock placed over it, will pick up and record many of these noises. Certain sounds, such as wind and all air ruffles, low muffled distorted sounds such as stuttered words, and breath poppings (heavy breathing moans) are all undesired and would cause muffled, distorted sounds in a recording. A microphone windsock is placed over the microphone to help block out these noises. 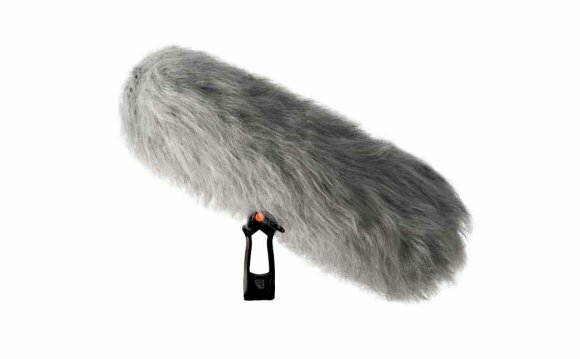 The foam is specifically designed to absorb these air ruffles and mumbled sounds, thus preventing them from reaching the microphone and getting recorded. Thus, the microphone windsock acts a noise filter so these undesired noises aren't recorded. The windsock is placed directly over the microphone, absorbing the undesired sounds so that they cannot penetrate to the microphone and be recorded. The windsock, thus, acts as a filter so that the microphone doesn't pick up undesired noise signals. Breath popping- Being that most microphones work by talking close to them, usually only an inch away, one extremely common undesired noise that would be picked up is breath popping. Breath popping is heavy breathing or moans of breath that a user may exhale. Usually when a person talks for an extended period of time, he begins to breathe out heavily from the exhaustion of talking to catch his breath. If this sound were picked up in a recording, it would appear as a loud noisy distorted signal in between speech. This is largely undesired. A microphone windsock serves to block the microphone from picking up these breath popping sounds, which allows for a cleaner output recording. Stuttering- In the same manner, the windsock can also block low frequency stutter noises that a user may speak if he stumbles over certain words. Certain words such as "buh" in the word "but" or "puh" in the word "please", just for examples, can be filtered out if a user speaks them, since they usually appear as jumbled low frequency noise that isn't much different than the noise from breath popping. Thus, a windsock filters this out as well. Wind noises- Another common noise signal that a microphone windsock helps prevent is the sound of wind. If a microphone is left uncovered without a windsock piece, it will pick up the sound of wind either in an internal environment such as someone getting up and walking, creating air movement, or in an external environment such as outside wind. This would create air ruffles, which again would appear as noise on a recording signal. The windsock's foam piece functions to block this wind signal from being recorded by a microphone. Microphone windsocks are almost always used with all microphones to prevent distortion due to breath poppings, wind, and all other air ruffles that may be produced in any environment. They come in a whole sort of variety of shapes and sizes to accomodate differing microphones.